This entry was posted in A Magical world filled with mystery and tagged Bow Hunting, Changed Worldview, Funny, funny blogs, Humor, Hunting, La Boheme, Maserati, puccini, vanity license plates. Bookmark the permalink. 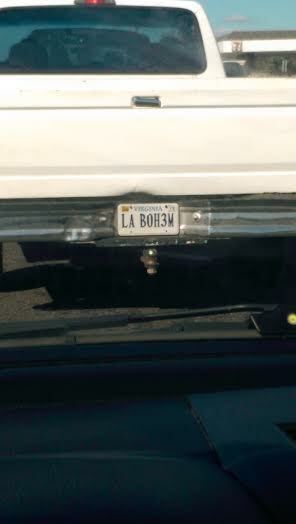 Maybe it’s not the opera specifically but “la vie boheme” that the truck embodies. thats not possible at all considering the area I live in. If anything, people in my area would think it was a type of beer. My first thought…sadly…was that it must be a stolen plate.